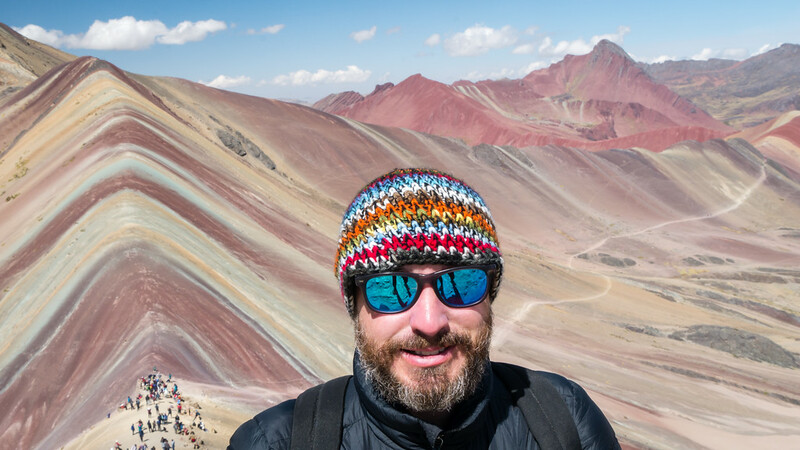 Is Peru’s Rainbow Mountain Hike from Cusco Really Worth It? 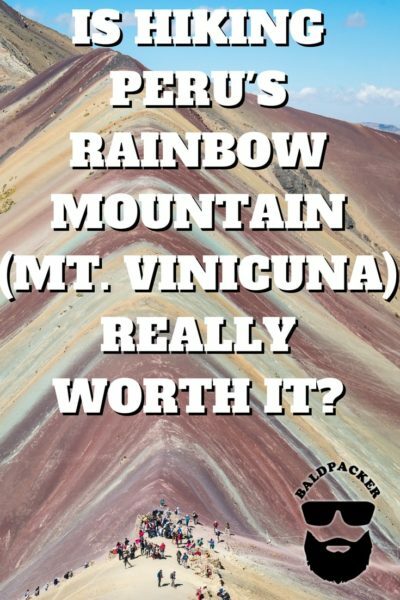 Rainbow Mountain, actually named Mount Vinicuna, has become one of the most popular day-trip activities from Cusco, Peru. 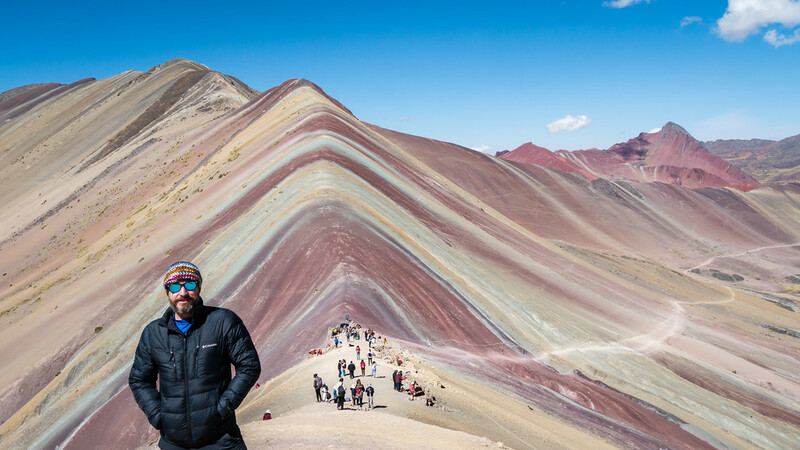 There are hundreds of agencies in Cusco selling trips for the hike, often with overly-saturated photos that greatly misrepresent what Rainbow Mountain actually looks like. Before hiking, Sara and I read numerous online blog posts and reviews that made the Rainbow Mountain trek sound horrible. People complained of pale colours, huge crowds, long cramped bus rides, altitude sickness, horrible weather, poor guides, and terrible food. We read so many bad reviews that we were very close to skipping the hike altogether. 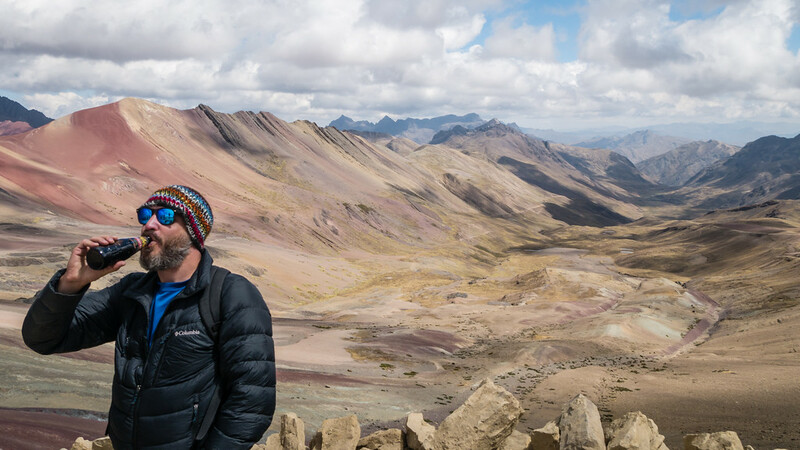 In this post, I’ll address the negative reviews and provide hints and tips for making your Rainbow Mountain hike experience better. While I can understand why people reported bad experiences hiking Rainbow Mountain, Sara and I both really enjoyed ourselves. If you follow my advice, I can confidently say that hiking Rainbow Mountain is 100% worth it! Hiking in bad weather is never fun. Waking up at 3am for a long bus ride to hike in rain and cold for scenery that requires good light is even less enjoyable. 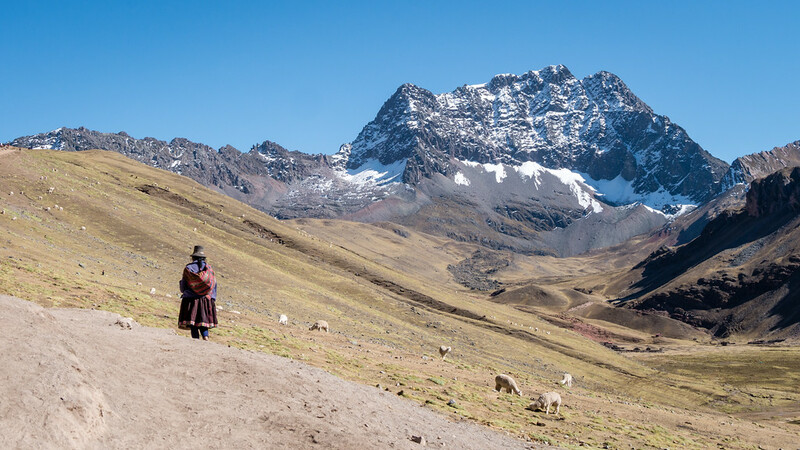 The months of June to August are typically the dry season in and around Cusco and your chances of enjoying good weather are much higher in these months. While mountain forecasts are never perfect, it doesn’t hurt to check and plan to hike on a day that’s forecast to be sunny. If the forecast is for rain and you can’t postpone your hike, you may be better off skipping the trip altogether. 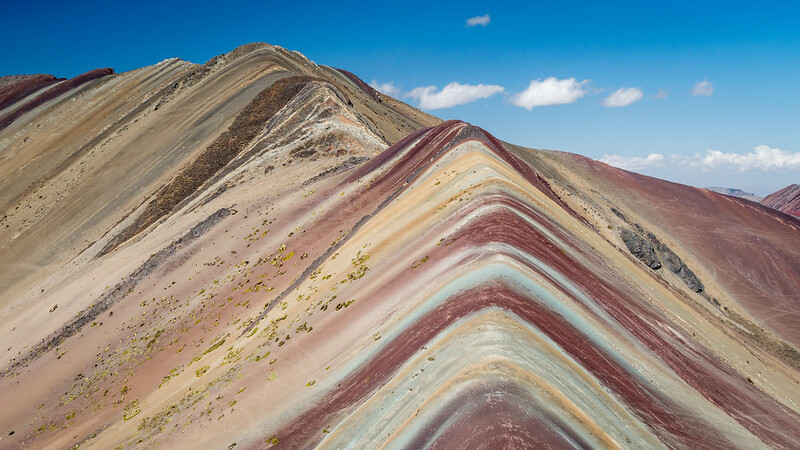 There are hundreds of agencies selling Rainbow Mountain day tours from Cusco and it is very difficult to differentiate between the trips offered. Unless opting for a higher-end “luxury” package with a known operator, I’d recommend just choosing the cheapest tour you can find. Sara and I paid 55 sole each (US $17) in July 2017, including everything (transport, breakfast, guide, lunch) but the 10 sole National Park entrance fee. Many other agencies were charging 70+ soles. While they may have offered better meals, it appeared most buses were doing the exact same itinerary and stopping at the same standard of restaurants for breakfast and lunch as we did. I’d recommend saving the money on your initial booking and then using your savings to buy snacks and drinks during the day, which also gives you the flexibility of when to eat. This is helpful given the days’ strange timetable and precautions you’ll want to take for the altitude. There is no way to completely avoid the crowds on Rainbow Mountain, especially during high season, but the earlier you arrive the better. Our pick-up time was 3:30 am. Yes, it was disgustingly early. To make matters worse, it took a while to pick everyone else up which meant we did not actually leave Cusco until nearly 5am. Thankfully, even with a 40-minute stop for a simple breakfast consisting of pancakes, bread, manjar blanco (caramel spread), coffee, and tea, we still arrived at the Rainbow Mountain parking lot at 8:30 am, before the majority of buses. While we were not the first people on the mountain, we were definitely among the earliest hikers. The early departure made the slow 1.5-hour hike up Rainbow Mountain much more enjoyable compared to what it would have been even an hour later. From June to August, I would avoid booking any tour offering pick-ups in Cusco at 5 am or later. You should also consider bringing a blindfold, earplugs, and a travel pillow to make sleeping on the bus easier. During your breakfast stop, encourage the group to eat and be ready to depart to the trailhead quickly! For comparison, we walked down the mountain around noon. At that time, there were so many people we felt like ants on an ant hill. It made it difficult to walk at our own pace and there was a lot of dust being kicked up by the hundreds of boots on the trail. Further, it was more difficult to stick to the main trail with so many people on it at once, which causes more environmental impact than necessary. Overall, because of the crowds, our hike down was far less enjoyable than our hike up. It pays to be early! 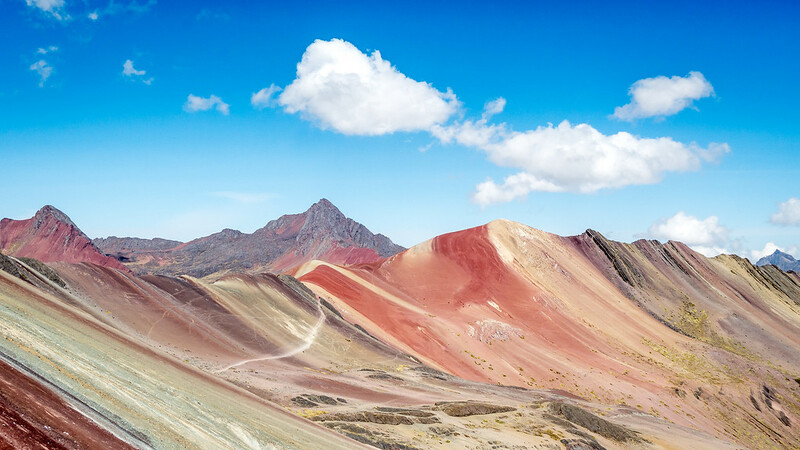 The Rainbow Mountain pass, where the colours are best viewed, is located at approximately 5,020 meters (16,466 feet) ASL. 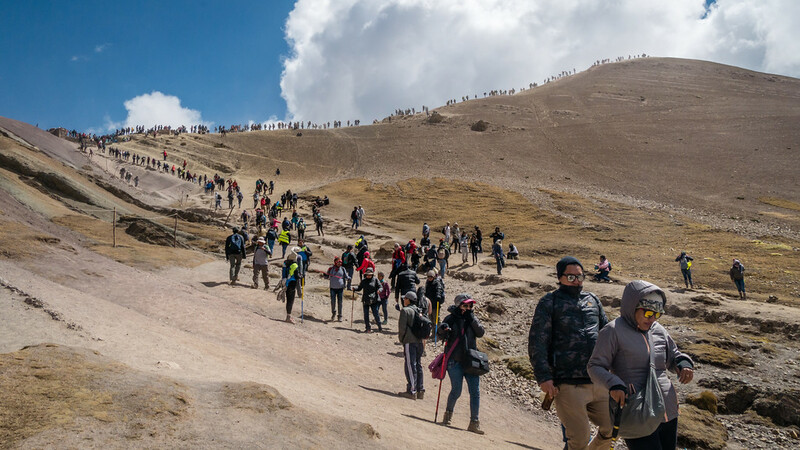 For many tourists, 5,000 meters is the highest they will ever go in their lives and thus advanced planning is necessary to ensure you can handle the altitude. For comparison, Cusco is around 3,400 meters and Machu Picchu is only 2,430 meters. Yet, people even struggle with the altitude in those towns. 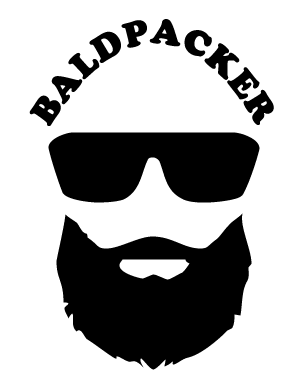 The best way to handle high altitude for most people is to acclimatize slowly. 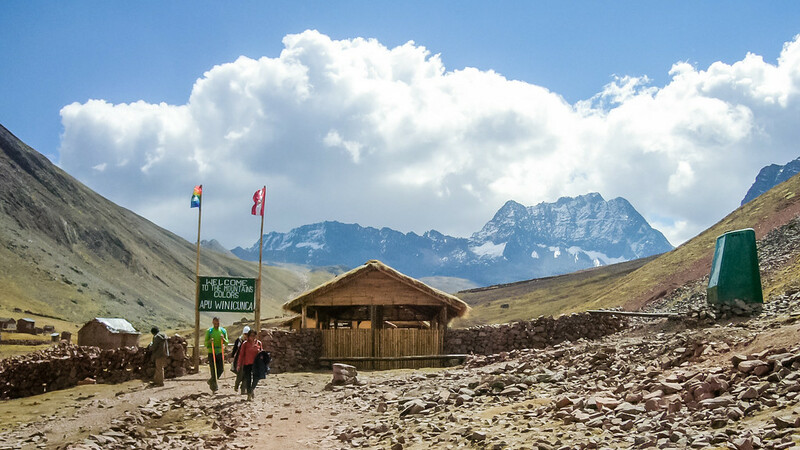 Therefore, it’s best to spend a few days exploring in and around Cusco before attempting Rainbow Mountain so that you’re only increasing 1,600 meters rather than several thousand meters on the day of your hike. I’d also highly recommend avoiding alcohol, staying hydrated, not eating too much, chewing coca leaves, and walking slowly up the mountain. The best piece of advice I was given when hiking up Mount Kilimanjaro (5,895 meters) was to walk as though my shoelaces were tied together. In other words, slow, steady, small steps to avoid gaining too much altitude too quickly. Hiking at altitude favours the turtle, not the hare! Take your time walking up, especially if you’re fit and feel like you can charge up the mountain; if you reach the top and are feeling dizzy and nauseous, you’re realy not going to enjoy the scenery! One of the most common complaints I read is that Rainbow Mountain’s colours are not as advertised. While it is true that much of the promotional materials used are ridiculously over-saturated, I was pleasantly surprised by just how vibrant the colours really were. Perhaps it was because my expectations were set so low, or because we had better morning light than others, but I truly found the colours stunning the day we were there. When taking photos, I always try to capture scenes as realistically as I can and take RAW photos that I try to realistically edit in Lightroom later. Given how many other comments I’ve seen online accusing photographers of photoshopping their Rainbow Mountain photos to make them unrealistically colourful, I also experimented with my in-camera settings to see whether post-processing edits are really to blame or not. The truth is, the colours you see and the photos you take will really depend on the light you have as well as your camera or phone’s in-camera processing. Amateur photographers may end up with completely unrealistic results just based on the enhancements or filters their cameras apply, as happened in my experiments. Everyone’s not out trying to misrepresent things! Professional photographers will definitely want to shoot RAW and may still need to desaturate the images and/or adjust white balance in post-processing to obtain more realistic results. 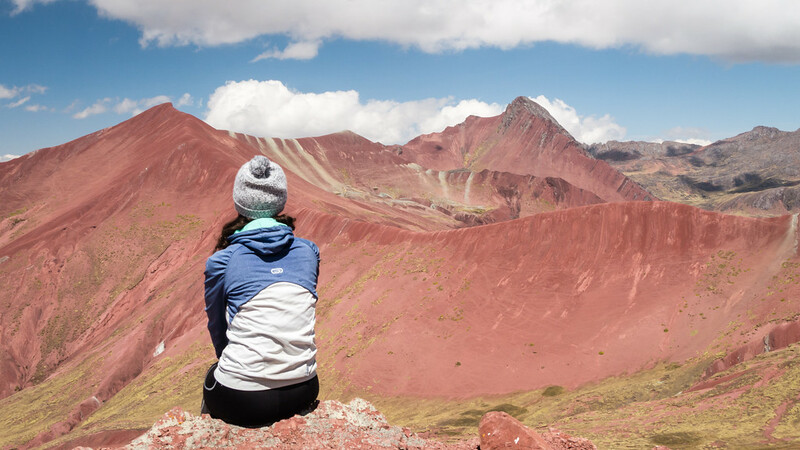 One of the added benefits of arriving to Rainbow Mountain early is that you should have time to hike to the Red Valley (Valle Rojo). There is a separate 5 sole fee charged for visiting Valle Rojo, since it is in a separate National Park, but it is definitely worth the cost. On a clear day, you’ll have stunning views of vibrant red rock contrasting against the green vegetation and snow. I was surprised but please at how few people actually made the additional ~15 minutes to walk to Valle Rojo. The lack of crowds was a welcome break from the Rainbow Mountain viewpoint and Sara and I took the opportunity to sit, snack, meditate, and absorb the stunning scenery. 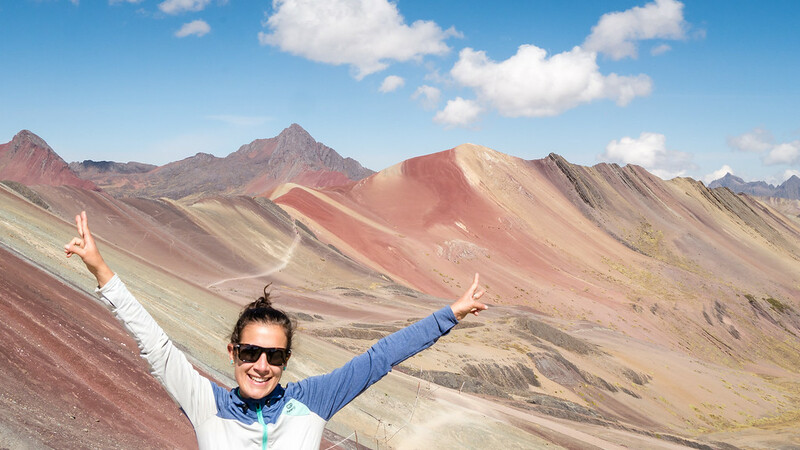 If the crowds at Rainbow Mountain prove to be too much, get your photos there and then escape to the Valle Rojo for some peace in nature. As an added bonus, while walking back, you’ll be reminded of the crowded ant hill you left behind! No matter how much planning you do for your hike, you’ll have very little control over the external factors affecting your hike. While you can do your best to acclimatize to the altitude and arrive early, on a day with good weather, the majority of variables will be outside of your control. The Rainbow Mountain tours are long and tough day trips. 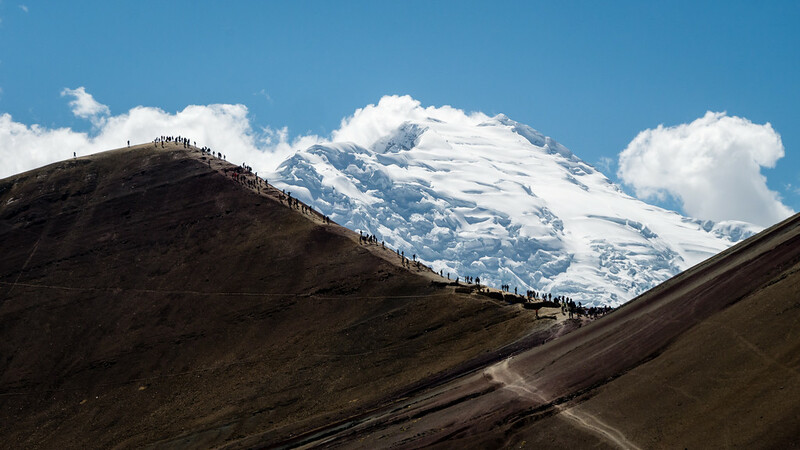 You’re waking up early, spending several hours in a cramped bus, hiking at altitude with throngs of people, and may or may not have the right light for vibrant colours and photos. That means your experience is largely going to depend on your attitude. Just when the crowds were starting to stress me out and I had my fill of photos, I discovered that locals were selling beers for 7 soles. There aren’t many opportunities in life to crack a beer at over 5,000 meters and it offered the perfect finale to our hike. In conclusion, the Rainbow Mountain hike is 100% worth it if your timing is right! 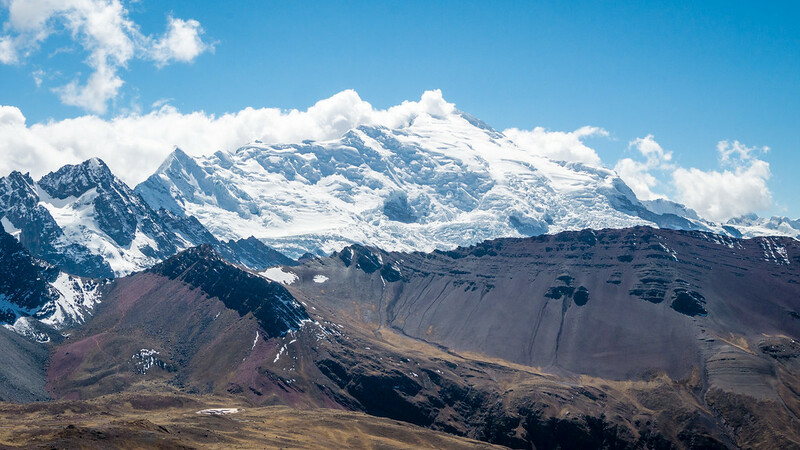 Good weather, fewer crowds, and hiking once acclimatized to altitude will make all the difference between a wonderful experience and a dismal one. Happy hiking! Hi, I heard that you can ride horse (or pony) to climb the mountain. is it still possible? Yes, but I would highly discourage it. The animals do not look well treated and they leave droppings all over the trail. I do not believe you can ride them all the way to the top and will still need to walk the steepest / most difficult section. If you’re unable to walk it yourself I would discourage going at all. What tour company did you use? I don’t recall – the cheapest we found. I did not see a difference among the various agencies. I would go for the cheapest one that picks you up the earliest in the AM. Even if you’re the first one picked up for the day (as we were) you’ll still be happy to arrive before the masses. Encourage your group to eat breakfast and get moving as quickly as you can as well.